Being a first-generation Haitian American woman, I grew up in a culture and society that constantly reminded that I have to be a “lady” at all times – and most times that meant being seen and not heard. Being part of YWCA Brooklyn has taught me that my voice matters and it is meant to be heard. I have come to learn that I am the change that I want to see in the world and that in order for changes to be made, young people like myself have to put pressure on the older generations to get things done. 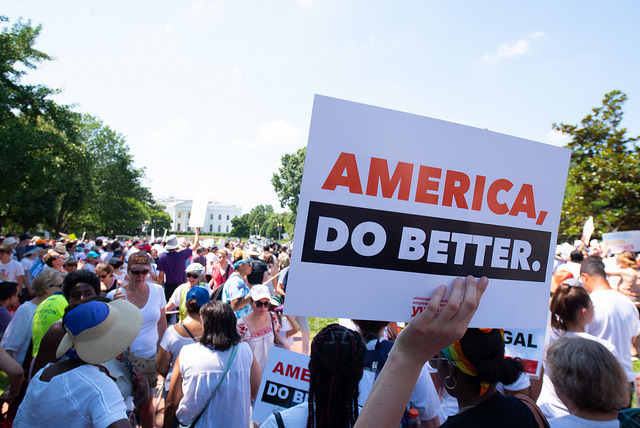 Going to the Families Belong Together rally in Washington, D.C. on June 30th with YWCA Brooklyn was truly a life-changing experience. Before joining YWCA Brooklyn’s LEAD program, I never thought I would be participating in such meaningful advocacy work. On the bus ride to D.C., my mind was racing. All of these thoughts, among so many others, were racing through my head and I had so many emotions rushing through my body. But as soon as we got into the city and closer to the rally site, all the anxiety, negative emotions and thoughts left my mind. I was excited to fight for what I believe in! For the first time in my life, I was using my voice to call for change and I was not being the quiet young lady that society has always taught and pressured me to be. I was finally growing into the person I always dreamt I would be but never really thought I would become. Going to the rally last month gave me hope. It was so comforting to be surrounded by thousands of people who were fighting for the same things that I am. People are being incarcerated at inhumane rates in the United States, and young children are being separated from their families – through incarceration, immigration policies, and more. It was wonderful to see so many people coming together to stand up for what is right, to demand that families belong together and free! Going to the rally taught me that I am a strong young woman who has a voice. 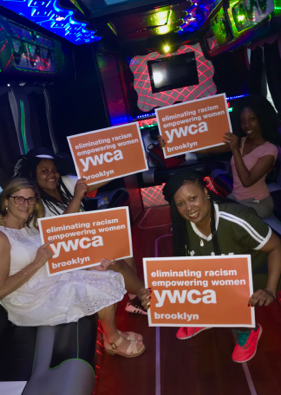 Being part of YWCA Brooklyn is providing me the support of so many people who not only want me to be successful but also want to help me fight for the changes I want to see in the world.